Episode #106: Face To Face With Yesterday: The Adventures Of Superman #474! FACE TO FACE WITH YESTERDAY was published in THE ADVENTURES OF SUPERMAN #474, January 1991, published on November 28, 1990. It contained 32 pages and sold for a dollar even. Mike Carlin was the editor. The cover was pencilled by Dan Jurgens and inked by Art Thibert. The story was written and pencilled by Dan Jurgens, inked by Art Thibert, lettered by Albert De Guzman and colored by Glenn Whitmore. There is no reprint information about this issue, so check the back issue bins of you local comic book stores or the internet. This episode is a week late because I had a cold on Christmas week, but it is more of a New Year's story. NEXT EPISODE: SUPERMAN: THE YEAR IN REVIEW! NEXT CHRISTMAS WEEK: A double feature: SUPERMAN #64, METROPOLIS MAILBAG & THE ADVENTURES OF SUPERMAN #487: CHRISTMAS IN SUICIDE SLUM! SUPERMAN FAN PODCAST is at http://thesupermanfanpodcast.blogspot.com/ . Send e-mail about this podcast to supermanfanpodcast@gmail.com . Episode #105: Superman Vs. Captain Marvel! On December 14, 1972, DC published SHAZAM 1, February 1973, their first comic book featuring the old Fawcett Comics character Captain Marvel. While Superman and Captain Marvel never fought in a cross-over story, their two publishers did battle each other in court. Superman and Captain Marvel first met in a comic book story titled SUPERDUPERMAN! in MAD #4, April/May 1953. To read this story online go to: http://kitscomics.com/captain/34.htm . DC, which now owns MAD MAGAZINE, has reprinted the story in MAD ARCHIVE vol. 1, which collected issues 1 - 6. 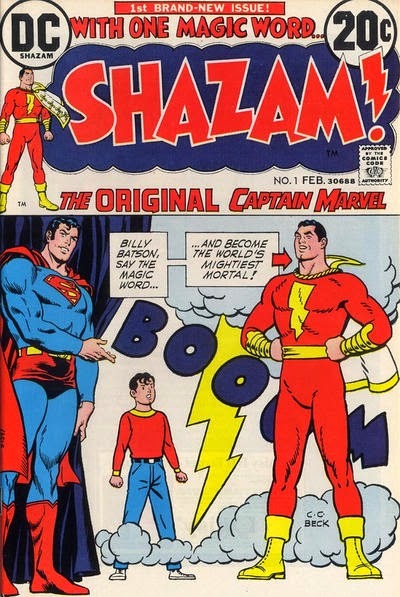 DC has also reprinted the early issues of SHAZAM, which ended with issue 35 in 1978, in SHAZAM: THE GREATEST STORIES EVER TOLD, and SHOWCASE PRESENTS: SHAZAM! vol. 1. For a complete history of Captain Marvel go to Bill Jourdain's podcast THE GOLDEN AGE OF COMIC BOOKS, episode 20, October 17, 2005, http://goldenagecomics.org/wordpress/2005/10/17/golden-age-of-comic-books-october-17-2005-20/. Episode #104: Superman In Exile, Part V: The End Of Exile! 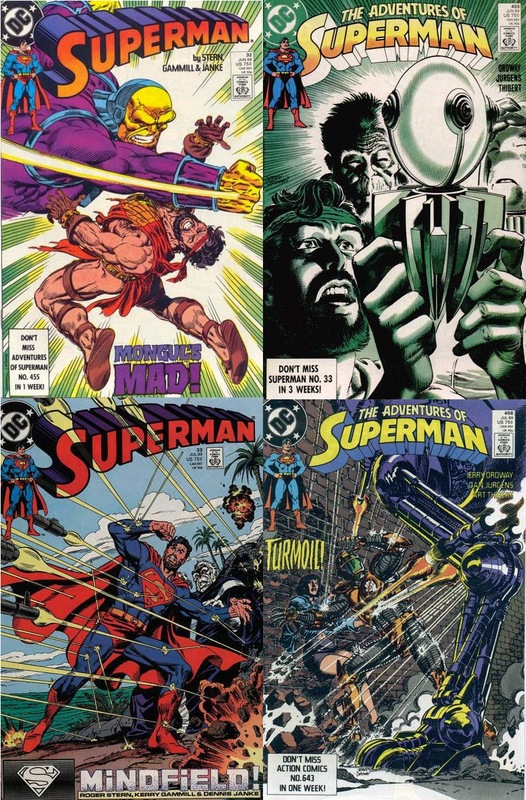 (Top L to R:) Superman 32 & Adventures Of Superman 455! (Bottom: L to R:) Superman 33 & Adventures Of Superman 456! 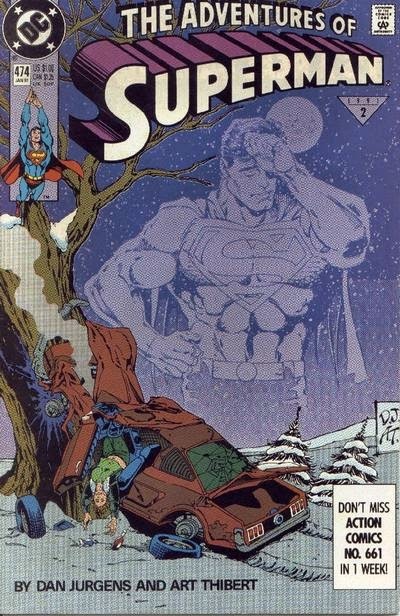 This episode concludes our look at the SUPERMAN IN EXILE storyline from the late 1980's. It was collected in the trade paperback SUPERMAN: EXILE. 66: Superman In The Pocket Universe! Superman Fan Podcast Special Blog: Superman In Exile Checklist!, posted on April 25, 2009, lists all of the issues discussed in this series of podcasts so you can read them for yourself! 71: Superman In Exile, Part I, Free Comic Book Day & The State Of Superman Comics! 72: Superman In Exile, Part II & Free Comic Book Day! 90: Superman In Exile, Part III! 103: Superman In Exile, Part IV: Action Comics Annual 2, 1989! SUPERMAN 32 and THE ADVENTURES OF SUPERMAN 455. SUPERMAN 33, THE ADVENTURES OF SUPERMAN 456 and ACTION COMICS 643 (its first monthly issue since the end of ACTION COMICS WEEKLY). The editor for all of these issues was Mike Carlin. Next episode: Superman Vs. Captain Marvel! SUPERMAN FAN PODCAST is at http://thesupermanfanpodcast.blogspot.com/. Send e-mail about this podcast to supermanfanpodcast@gmail.com. MY PULL LIST is my spoiler free comic book review blog of the titles I read every week. It can be found at http://mypulllist.blogspot.com. Send e-mail about this blog to mypulllist@gmail.com. Episode #103: Superman In Exile, Part IV: ACTION COMICS ANNUAL #2, 1989! This episode continues a series of episodes exploring the SUPERMAN IN EXILE storyline from the late 1980's. This story was collected in the trade paperback SUPERMAN: EXILE. The featured story was printed in ACTION COMICS ANNUAL 2, 1989, published on April 11, 1989. It was 64 pages long for the price of $1.75. The cover was pencilled by George Perez and inked by Jerry Ordway. MEMORIES OF KRYPTON'S PAST was the title of the story. 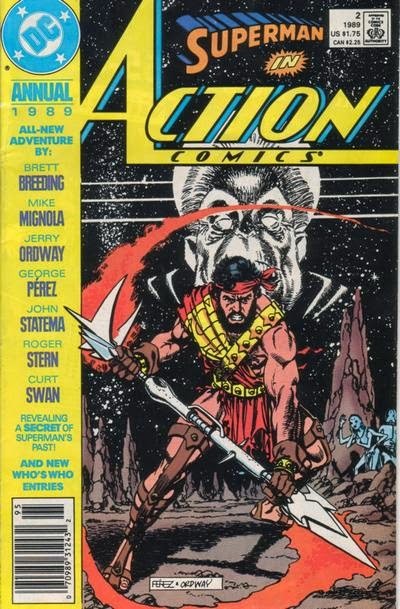 Writer and penciller Jerry Ordway and inker did the Warworld/Arena story, writer Roger Stern, penciller Curt Swan and inker Brett Breeding did the Superman/Attendant Lentra story and the Jor-El flashbacks, and writer and inker George Perez and penciller Mike Mignola did the Cleric story. This issue picked up the story from THE ADVENTURES OF SUPERMAN 454, May 1989. ACTION COMICS ANNUAL 2 was the first issue to be published after the last ACTION COMICS WEEKLY issue of 642 (discussed in episode 92), which was published several months earlier on January 24, 1989. NEXT EPISODE: The fifth and final episode on the SUPERMAN IN EXILE story, covering the following issues: SUPERMAN 32, THE ADVENTURES OF SUPERMAN 455, SUPERMAN 33, THE ADVENTURES 456 and ACTION COMICS 643. SUPERMAN FAN PODCAST can be found at http://thesupermanfanpodcast.blogspot.com/ . Expanded show notes are at http://supermanfanpodcastblog.blogspot.com/. Send e-mail to supermanfanpodcast@gmail.com .